Got it done last night! Honestly, this is embarrassing how some of these projects got stuck with maybe an hour or two's worth of sewing. This took me an hour to complete. I already had the main bag body fully complete. I think the stall happened because I bought the wrong length of zipper....and then got side-tracked onto another project. I had already made one of these bags for myself, and two for friends, and was impressed by the simplicity of construction, the clear instructions and the overall finished product. I have used mine as a cosmetics bag for every trip I've been on since I made it back in 2007. That is the year I bought these pretty bright fabrics I used for this bag. Up until I retired from teaching, we were travelling to Florida 4 times per year, and I was running trips to either Québec and France at Spring Break. It went on our camping trips, on guild retreats, to New York, to Indianapolis for the F-1 race in June/07; wow, that pink bag is one travelled bag!! And it's still just as good as the day I made it! If the fabrics remind you of Provence, France, you are spot on, as that is where I bought them! I bought enough to make a quilt, which has had some pieces added from my stash, and a basic idea for a pattern, but nothing made yet. No, I did not bring that project with me! I decided to just do it, and use the wrong length of zipper. I had some red pieces I brought with me for another project, so this one was perfect to make the top section. The ends are fine, and you would never know the difference if you didn't see the original pattern. Can you see where I quilted my name onto the bag? A view of the inside. I really like sunny yellow with red! It's not my go-to colour combination, but it does look pretty! I love this bag because of the 6 pockets that are on either side, great for organizing tubes of mascara, eyeliner, eyeshadow, lip gloss, tweezers, travel toothpaste, jewellery, etc. Here are my two side by side. You can see how the zipper extends beyond the bag and is then secured in place by tacking by hand and then sewing a button over to hide the tacking stitches. Nothing is in danger of falling out because of this method of construction. 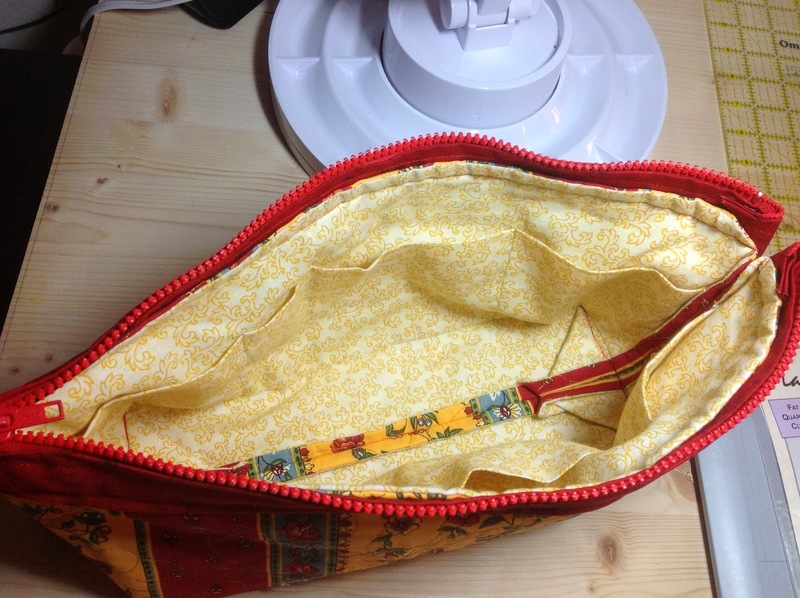 My red/yellow one has a small opening, maybe a 1/2" since the zipper isn't long enough to wrap over the ends of the bag. I think it will be just fine! Do you see the difference in threads used to quilt the bags? I used Sulky Blendables on the pink one, so you can really see the thread, since it's literally raised up off the fabric. 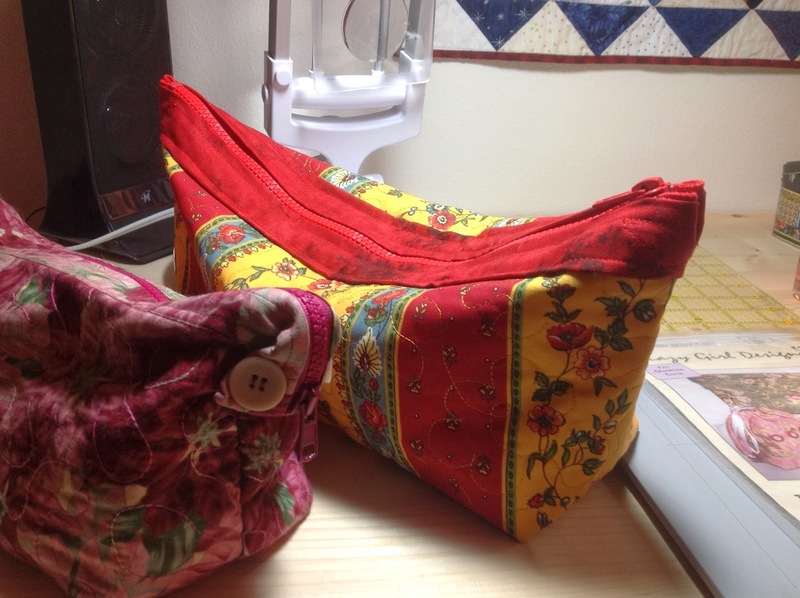 For the Provence bag I used a Sulky gold rayon to quilt and then an Isacord red to attach the zipper and its casing. I might use my Provence bag for carrying around sewing supplies. Haven't decided. A girl can never have too many cosmetic cases. 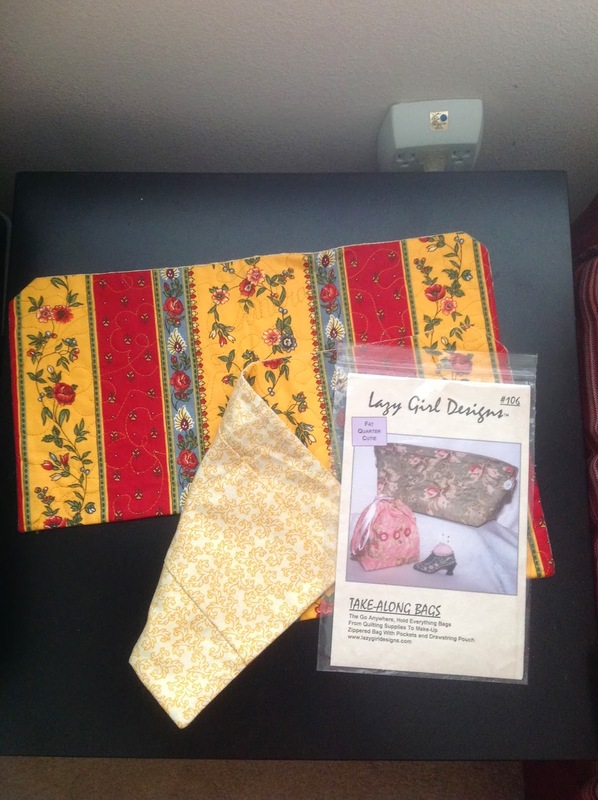 The pattern is Lazy Girl Designs #106. Hey! By checking that link, I just discovered she is on Craftsy too! I'll be checking her out! Today I plan to work on my Self Round Robin on an orphan block for my Kingsville Guild (I'm 2 months behind, egad). 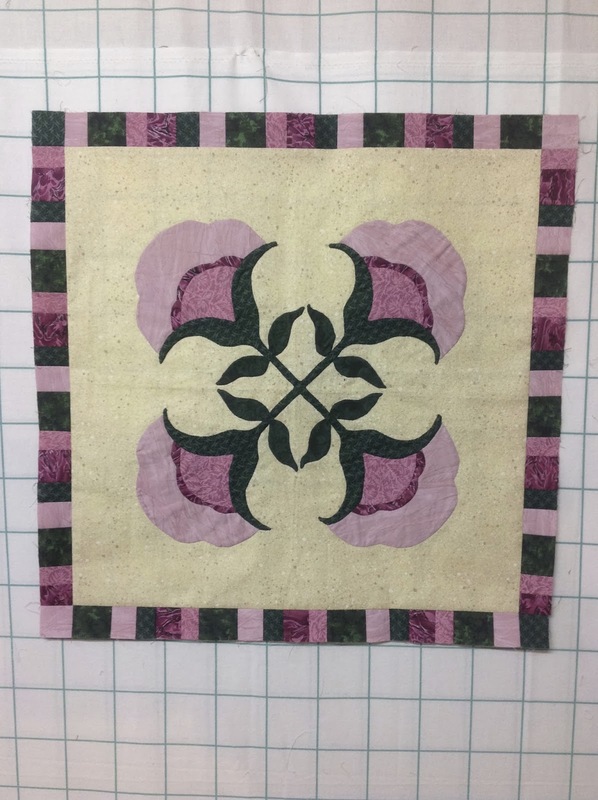 The first round was to add a stripe, so I created my own stripe fabric by piecing strips of the fabric I used in the original appliquéd block. I have to do flying geese and some appliqué. Then I have to email a guild member to find out what is due for this month! So I guess I'm nearly 3 months behind. Gulp. Oh yes I see your name! I re-discover my name regularly (that just sounds wrong lol) you sewed in handwriting on my quilt and I always admire that! 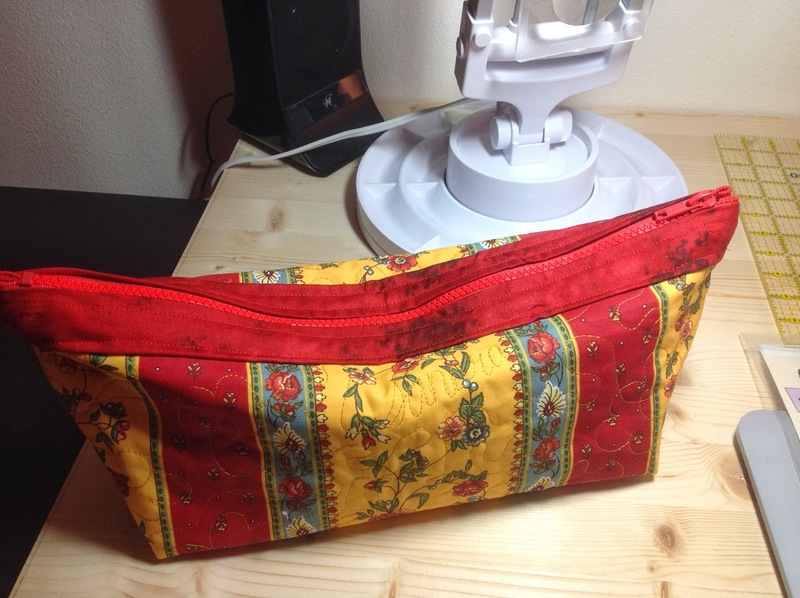 Love the cosmetic bag, and looks like the Self Round Robin is coming along just fine!